To administer Active Directory (AD) from Windows, use the Microsoft Remote Server Administration Tools (RSAT). The tools are available for all platforms, Microsoft actively supports. In Windows Server operating systems, the Microsoft Remote Server Administration Tools (RSAT) are included. Start the downloaded installer and follow the instructions. All features are installed automatically. Start the downloaded installer and follow the instructions. Click Start, enter Programs and Features into the search field and start the application. Group Policy Management Tools Provides the Group Policy MMC Snap-ins: Management Tool, Management Editor and Starter GPO Editor. Active Directory Module for Windows PowerShell Optional. Enables Active Directory (AD) PowerShell cmdlets. AD DS Tools Provides the Active Directory Users and Computers (ADUC) and Active Directory Sites and Services MMC Snap-in. Server for NIS Tools Adds the UNIX Attributes tab to ADUC objects properties. It enables you to configure RFC2307 attributes. DNS Server tools DNS MMC Snap-in for remote DNS management. Remote Desktop Services Tool Optional. Adds the Remote Desktop Services Profile tab to the ADUC user object's properties and installs the RDP server administration MMC Snap-in. Install this feature to configure remote desktop protocol (RDP) settings in ADUC. Click OK to install the features. 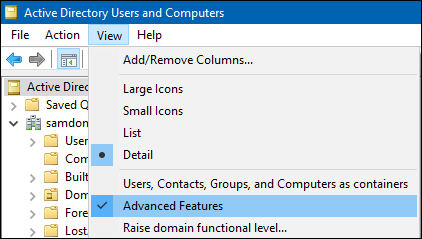 You can find the installed tools in the Administrative tools menu in your start menu. Alternatively, add the Snap-ins in the MMC using the File / Add/Remove Snap-in menu. Select the host on which to install the features. Click Next on the Roles page. Select Features in the navigation tree and click Add Features. Group Policy Management Provides the Group Policy MMC Snap-ins: Management Tool, Management Editor and Starter GPO Editor. AD DS Snap-Ins and Command-Line Tools Optional. Provides the Active Directory Users and Computers (ADUC) and Active Directory Sites and Services MMC Snap-in. This feature is not supported in Windows Server 2016. For details, see Missing "Unix Attributes" tab in ADUC on Windows 10 and Windows Server 2016. Active Directory Module for Windows PowerShell Enables Active Directory (AD) PowerShell cmdlets. Select the root of the navigation tree on the left side. Windows 10 and Windows Server 2016 do not support the Server for NIS Tools option. Without this feature, the Active Directory User and Computer (ADUC) console does not show the Unix Attributes tab on user and group objects. To work around this problem, set the attributes in Active Directory (AD) manually or use a different Windows operating system. To manually set the attributes, use the Attributes tab on user and group object's properties. Note that this tab is only visible if you enabled the advanced features in ADUC. For further details, see Enabling the "Advanced Features" Mode. If you set user IDs (UID) and group IDs (GID) manually, you must also track the last used UID and GID numbers manually. To report problems or incompatibilities when using the Microsoft Remote Server Administration Tools (RSAT), see Bug Reporting. This page was last modified on 1 June 2017, at 06:51. This page has been accessed 133,282 times.